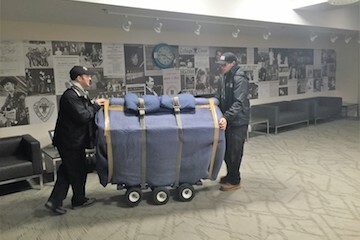 Our years of experience has allowed us to become the top choice piano moving company in Prince Edward Island. We are also the recommended piano mover for Long & McQuaid Musical Instruments and have been for the last 7 years. Islanders count on us to move those items that require extra planning because we know how to ensure their safe transportation. What sets us apart from other movers? It is our knowledge from moving specialized equipment such as pianos that has helped us translate those techniques to moving other speciality equipment such as safes, commercial fridges/freezers and Gym equipment. We employ a very competent team that has years of knowledge to problem solve many of the issues that come along with these types of moves. Let us put that knowledge and experience to work for you when it comes time to move that particularly difficult or fragile item.